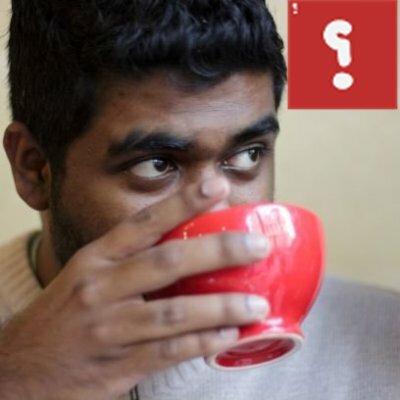 Ahmed Rizwan Abdulla, a Maldivian journalist, blogger and human rights advocate, is missing. The 28-year-old was last seen by his family on 7 August. Unlike most Maldivians of his age, Rizwan does not live with his family but rents an apartment in Hulhumale’, a 20-minute ferry ride from Male’ the capital. Rizwan is a deeply spiritual person, known to enjoy solitude. It is not unheard of for him to take time off from society to indulge in the right to be left alone. His close friends know that. This time, however, is different. Nobody knows where Rizwan is. His phone is switched off. His motorbike is still standing near Male’ ferry terminal, covered in dust. He does not appear to have been in his apartment since 7 August. His backpack, which contains his laptop, and which he is rarely without, is nowhere to be seen. He has not been to work at his newspaper, Minivan News, since 7 August. Rizwan’s family filed a missing person’s report with the police on Wednesday. Since news of his disappearance broke, a witness has come forward to say he saw Rizwan on the ferry from Male’ to Hulhumale’ around 1:30 a.m. on 8 August. The witness also confirms that Rizwan did not take the bus, the only form of public transport available at that time, into the dark and desolate Hulhumale’ town. Since then, nothing. Maybe Rizwan has gone off to be on his own. His colleagues have cautioned against speculation. But the state of the country makes it impossible for most not to do so. Rizwan’s disappearance resonates with many whose beliefs reflect and echo his own, even if they do not know him personally. People in Male’—if, like Rizwan, they support democracy, freedom of thought, free speech, and are against Islamist puritans dominating religion— live in a state of constant fear. Gangsters, religious extremists and heroin dealers have run of the city while the Maldives Police Service (MPS) continues to ‘bungle’ investigations into heinous crimes or ignore them altogether. The corrupt and unqualified judiciary, which continues to fail justice daily, makes a habit of releasing smugglers and dealers, even when they are caught with drugs worth millions. The MPS has failed at solving almost all major murders from the killing of MP Afrasheem Ali in October 2012 till now. If there is any success, it is from a confession. Even then justice is not guaranteed; it is not unknown for confessions to be elicited under duress. After a lull during the month of Ramadan, crime—including violent murder—has increased exponentially since Eid. In addition to the gang violence is the fear that hardline Islamists are also resuming their pre-Ramadan actions against freedom of thought and expression. The worst thing is, there is ample room to believe the authorities are complicit in these activities. Last June, ‘concerned citizens’, worried about a perceived increase in non-believers, met with the Islamic Minister as well as the Home Minister, to press them for stronger action against ‘unbelievers’. The same ‘concerned citizens’, as the high level government officials well knew, were involved in high-profile kidnappings and abductions of alleged non-believers around the same time. This policy of turning a blind-eye to crimes committed in the name of religion is made most obvious at the macro-level in the government’s refusal to put into place any counter-radicalisation programmes in the Maldives. Supporters of the Islamic State are multiplying in the country at an unbelievably rapid rate. 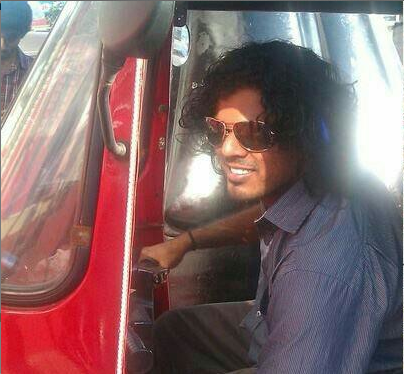 News of Maldivian fighters in Syria only broke in mainstream media in July this year after the death of two. Jihadist ideology, however, has been present and spreading freely for years. 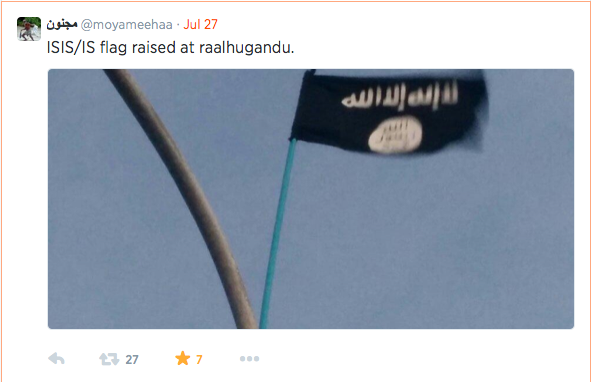 Many hundreds of Facebook profiles of Maldivians now proudly carry the IS flag or the black flag of other Jihadi fighters. Some such pages date back to 2010; many were created on or after July this year. While support for IS, Jabhat Al Nusra and other such groups is only becoming widely popular now, non-violent fundamentalists have had uncontrolled on- and off-line access to the Maldivian population for over a decade. Salafi scholars, preachers and activists dominate all institutions of education from the Centre for Holy Quran (which, by the way, is to get a new ten storey building) to the Centre for Higher Secondary Education and the Faculty of Law at the Maldives National University—and this is just in Male’. There is no authority overseeing education centres on outer islands. Not a week goes by without Salafi preachers and Sheikhs visiting one island or another to proselytise. There are monthly Da’wa camps, How to Pray camps, How to Sleep camps, How to Live camps and How to Die camps. The Maldives Police Service and the Maldives National Defence Force are often on the receiving end of such teachings. While there are divisions among subscribers to the various ideologies, they are all united in condemning Maldivians who refuse to fall in line with their vision of Maldives as an Islamic State, with strictly applied Sharia as its only legal system. Simultaneously with all the frenetic off-line religiosity, a substantial percentage of Maldivians are online using their social media platforms chiefly as a means of displaying their allegiance to violent and non-violent Salafi and other purist ideologies to proscribe them; to preach them; and to spread it among their friends. Like most users of social media everywhere in the world, they Share, Like, Poke, and Follow without question. With few exceptions: like Rizwan. Rizwan is a prolific user of the Internet, especially social media. He was among the first bloggers in the Maldives, is on Tumblr, and is a highly popular micro-blogger on Twitter, followed by many thousands. His online persona has the name of ‘Moyameeha’. He has vast empathy, and a good sense of humour; his #ferrytales entertain many. He is knowledgeable about how centuries old Maldives’ national and religious identity has been hijacked by fundamentalists within a short span of just over a decade. Unlike most people he can, and does, engage with those whose beliefs he does not condone. Rizwan does not believe in hatred in the name of religion. He does not believe in violence. And he is not afraid to say so. Maldivian supporters of IS flew their flag at the surf point in Male’ in July this year. Rizwan Tweeted a picture. When pro-Palestinian Maldivians on Thulusdhoo put up Nazi insignia to the dismay of Israeli tourists on the island, Rizwan—while clearly with the people of Gaza—was first to point out that anti-Semitism is not the same as solidarity with Gaza. 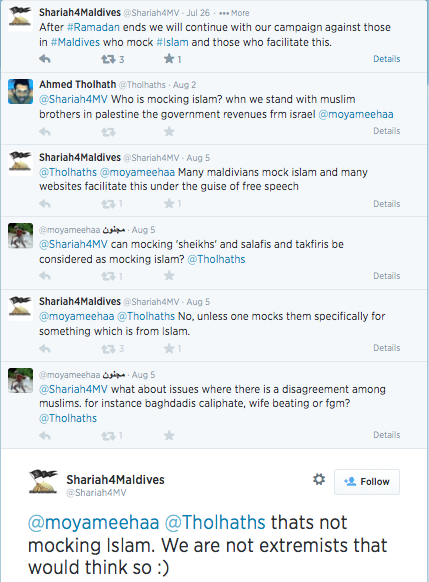 He is a vocal critic of the Islamist Adhaalath Party, and often points out the hypocrisy of their scholars/politicians. Rilwan’s last Tweet mocked former dictator Maumoon Abdul Gayoom’s notorious habit of dabbling in astronomy and ‘reading the stars’—often with disastrous results. Disappearances were a part of Maldivian life in pre-democracy times. And, with Gayoom’s family and cronies back in positions of power after last November’s elections, intimidation of dissenters and political opposition—using gangs and other violent forces—is also returning. For the many thoughts he expressed freely, Rizwan has made many enemies. There have been many warnings that his days are numbered. The gangsters were not far behind. Fact is, there is no room in the Maldives of today for people driven by a love of humanity. No place here for believers in non-violence. No space for those who refuse to subscribe to the idea of a vengeful God that wants to obliterate all who do not blindly follow His self-appointed avengers. It is the dominance of these people—willing to maim and kill for God or money—untempered by a government that could not care less, and emboldened by law enforcement officials that are complicit, which makes Maldives a dangerous place for those who believe in human rights and the rule of law. That is why Rizwan’s family and friends are fraught with fear for him despite their best intentions not to speculate. Because they know twenty first century Maldives is no country for good people. Good people like Rizwan. Regardless of the possibilities of all the awful scenarios Maldives today makes possible, all Rizwan’s friends and family are hoping against hope that he has not fallen victim to any of them. Their fervent wish is that Rizwan would be found safe. Today in Hulhumale’, they are all out searching for him. If you have any information regarding Rizwan that you think may help, please contact the police hotline at 332 2111, or Serious and Organised Crime Department at 9911099. And, anyone wishing to add to the ongoing search in Hulhumale’, please contact organisers via #findmoyameehaa hashtag, or on 775 4566 or 977 3250. Update at 16:44 GMT: Latest report from Minivan News, staff of whom were heavily involved in today’s search, says Rizwan was not on the 1:30 a.m. ferry as claimed by witness. Members of the search part thoroughly reviewed CCTV footage from the ferry terminal in Male’ and confirm that Rizwan did not get on the ferry at 1:30 a.m. on 8 August or any time between 0:00 and 03:00 that day. 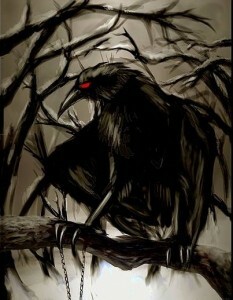 Who let the crows out? However you feel about MDP protests, you cannot say they are lacking in imagination. When they were at Raalhugan’du, MDP activists’ first base after the coup, the place had a buzz similar to the Occupy sites that sprang up in cities across the world in this year’s anti-capitalist fervour. There was music, political oratory, poetry, and pudding. The young, the old, the city-folk and the islanders mingled, united in their condemnation of the coup. Having been sent packing from Raalhugan’du, accused of possession of condoms and beer, MDP activists have transferred the atmosphere to street demonstrations. Now they come with drums, slogans, baton twirlers, and clever placards. Now we have the Case of the Missing Crows at Usafasgan’du. Who let the crows out? Did they engineer a great escape, tired of the crowd incessantly cawing for early elections? Or, did the police kidnap them as is alleged?